I’m excited for this arc. I mean, I’m excited for every arc. I’m excited for every crazy thing Jimmy and I come up with that I get to draw. That armored fish person from our Merchant chapter? Super fun for me. Some crazy stuff that happens in this chapter? Super fun for me. Some EVEN CRAZIER stuff that happens in the next chapter was so fun I wanted to spoil it for you guys right away. But I didn’t. Because that’d be silly. But the thing that makes me the most excited is that this arc is going to usher you guys into the larger world we’re creating. Our first two chapters, “January, 1627” and “Vultures” function as self-contained stories. 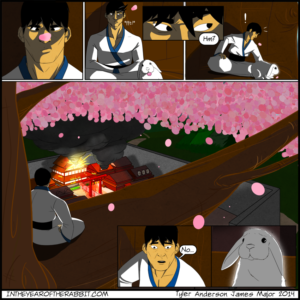 There’s not a ton of character development aside from “This is a samurai, he has a bunny and he doesn’t like bad people” and then hijinks ensue. They each have a definitive end and could just as easily be a self contained story. Our Merchant chapter showed you the first hint that there’s maybe another world within this world that we’d be exploring and this chapter will build on that even further. There’s cool new stuff-a-coming and I can’t wait for you all to see it.